Feline infectious peritonitis (FIP) is a contagious viral disease of cats. 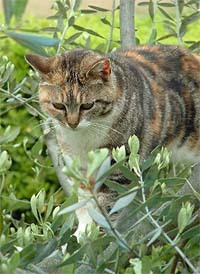 Young and old cats appear to be most susceptible; however, cats of all ages can become infected. The disease is worldwide and affects exotic cats (lions, cougars, bobcats, lynx, jaguars, and cheetahs) as well as domestic cats. Cats infected with FIP transmit the virus through body fluids (respiratory and oral secretions) and feces. Infection occurs by inhalation or ingestion of the virus. Close contact between cats is very important for transmission of the disease. The disease can also be passed from the queen to her unborn kittens or to young kittens through the milk. Cats living in crowded, unsanitary conditions are at risk of FIP infection. Animals infected with feline leukemia virus (FeLV) or feline immunodeficiency virus (FIV) are more susceptible to FIP than non-FeLV and non-FIV infected cats. Clinical signs of the disease are variable and non-specific. Often, a fluctuating fever is an early symptom of FIP. Other noticeable symptoms include weight loss, fatigue, and lack of appetite. Later, swollen abdomen, jaundice, kidney and liver disorders and eye problems occur. As the disease progresses, cats typically develop an "effusive" or "dry" form of FIP. The effusive form is characterized by an accumulation of thick yellow fluid in the body cavities. In the dry form, nodular masses are seen on the surface and inside certain organs: the spleen, liver, kidneys, eyes, brain and lungs. A thorough physical examination by a veterinarian is recommended for any cat showing symptoms of FIP. X-rays and blood tests are necessary for diagnosing the disease. 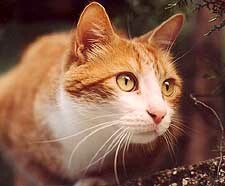 A vaccine for FIP has been available since 1991. The effectiveness of the vaccine is controversial. Many hospitals do not recommend vaccinating against this disease. Good animal husbandry practices are important for the prevention of FIP in multi-cat households.